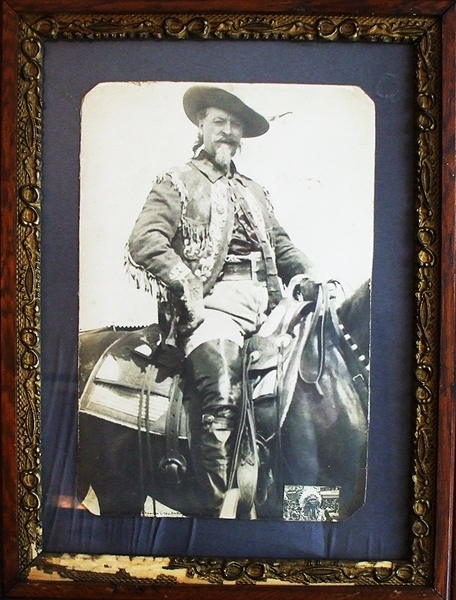 Framed Photo, 9” x13”, in larger frame, identified in the negative, 1899 Courier Litho Co., Buffalo New York.Additionally there is 1-1/2’ x 1” photo of a Native American in full agala. Although the frame has minor damage, the image is near fine. William "Buffalo Bill" Cody poses on horseback in a camp for Buffalo Bill's Wild West Show. Cody wears a wide-brimmed hat and a buckskin coat with tassles and small beads sewn on it in a pattern that forms bands of flowers. He wears gauntlets on his hands and holds a rifle across his lap. He also wears thigh boots, and his belt has a large, square buckle. He is mounted on a dark horse.